DETROIT, Mich. (March 27, 2019) - Thanks to Comerica Bank, fans will have the opportunity to experience all the fun and excitement of the 30th Grand Prix in Detroit's history FREE of charge on Friday, May 31. For the seventh consecutive year, Comerica Bank Free Prix Day will allow everyone to witness the first day of on-track activity at the Chevrolet Detroit Grand Prix presented by Lear at no cost. 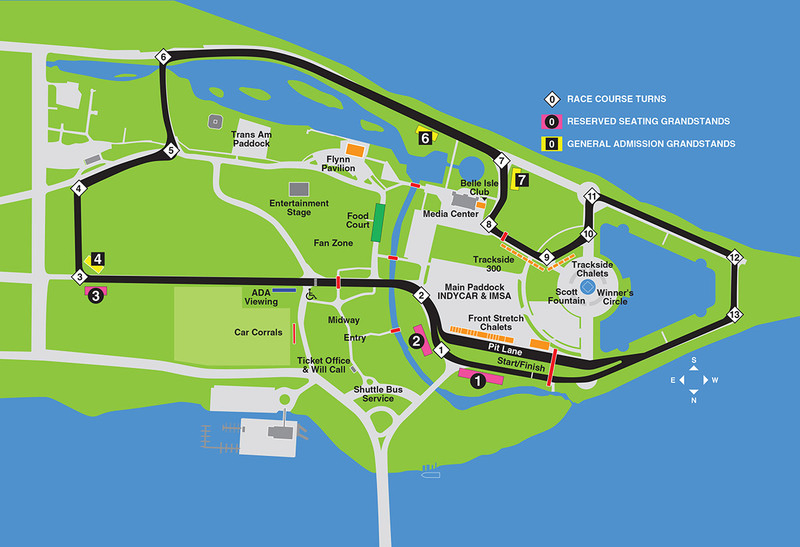 Fans are encouraged to visit the Raceway at Belle Isle Park, tour the paddock, known as the "locker room of motorsports," watch the world-class racing action and experience all of the interactive games, displays and family fun at the Grand Prix, courtesy of Comerica Bank. "We are excited to announce the return of Comerica Bank Free Prix Day and we encourage everyone to come down and experience the first day of the Grand Prix on Belle Isle," said Michael Montri, President of the Chevrolet Detroit Grand Prix presented by Lear. "Free Prix Day is a tradition at the Grand Prix and, thanks to Comerica Bank, we look forward to celebrating the 30th Grand Prix event in Detroit with all of our fans at no charge on Friday, May 31st." Comerica and Grand Prix officials will visit Cass Technical High School in Detroit this afternoon and surprise a group of about 40 kids with a trip to the popular summertime festival. The students will get a first-hand look at how science, technology, engineering and math (STEM) is put into action in racing when they visit the Chevrolet Detroit Grand Prix presented by Lear for Free Prix Day on Friday, May 31 as special guests of Comerica Bank. The select group of students will have the opportunity to see how the STEM initiatives they have studied in school translate to the race track, as they will get a behind the scenes tour of the Grand Prix on their trip to Belle Isle. This afternoon's event as Cass Tech will celebrate the return of Comerica Bank Free Prix Day and feature a panel discussion with Comerica Bank Executive Vice President and General Auditor - and Cass Tech graduate - Christine Moore; IMSA WeatherTech SportsCar Championship winning driver, Pipo Derani; Cadillac Racing Program Manager, Laura Klauser, along with Montri. "It is an honor for us to collaborate with the Detroit Grand Prix once again and offer our community the opportunity to experience up-close one of Michigan's biggest and unique attractions," said Mike Ritchie, Comerica Bank Michigan Market President. "To see so many families visit Belle Isle and take part in all the exciting activities available throughout the day has been such a joy over the past six years. We are excited to continue partnering on this free day. The Grand Prix has a long, successful tradition in Detroit and Free Prix Day has become one of the marquee events that makes it so special." The on-track action on Comerica Bank Free Prix Day will feature all three series competing at the Grand Prix. The NTT IndyCar Series will have two practice sessions as they prepare for the only doubleheader weekend on the series' schedule - the Chevrolet Dual in Detroit. IMSA will host two practice sessions and qualifying for the Chevrolet Sports Car Classic race to take place on Saturday, June 1, while the Trans Am Series presented by Pirelli will feature both practice and qualifying sessions for Saturday's race. Derani is one of racing's top young sports car drivers. He won his first race driving for Cadillac in the 12 Hours of Sebring on March 17, and in his first race in Detroit last summer, he won the pole position and wound up finishing seventh on Belle Isle. Klauser, who lives in Michigan, has her own unique success story in motorsports. After earning a Master's Degree in Engineering from the University of Michigan, she began working for General Motors through a student co-op program. She joined the company full time in 2008 and took over the championship-winning Cadillac DPi sports car program in 2017. At the 2019 Chevrolet Sports Car Classic on Belle Isle, Derani and his teammate Felipe Nasr will drive the No. 31 Action Express Racing Whelen Engineering Cadillac DPi-V.R. in IMSA's DPi category. Nasr won last year's race in Detroit in the No. 31 Cadillac and he and Derani will look to defend the crown when they race on Saturday, June 1 during the Grand Prix weekend. On Comerica Bank Free Prix Day the students from Cass Tech will reconnect with Derani and Klauser in the paddock area on Belle Isle and have the opportunity to tour the Action Express Racing garage on Friday, May 31. Fans interested in more information on the Grand Prix, or to purchase tickets for the Saturday and Sunday activities on Belle Isle, can visit www.DetroitGP.com or call 866-464-7749 (PRIX). ABOUT COMERICA BANK Comerica Bank, a subsidiary of Comerica Incorporated, has served Michigan longer than any other bank with a continuous presence dating back 170 years to its Detroit founding in 1849. It is the largest bank employer in metro Detroit and has more than 4,800 employees (FTE) statewide. With one of the largest banking center networks in Michigan, Comerica nurtures lifelong relationships with unwavering integrity and financial prudence. Comerica positively impacts the lives of Michigan residents by helping customers be successful, providing financial support that assists hundreds of charitable organizations, and actively participating in Detroit's downtown revitalization. Comerica Incorporated (NYSE: CMA) is a financial services company strategically aligned by three business segments: The Business Bank, The Retail Bank, and Wealth Management. Follow on Facebook at www.facebook.com/Comerica and Twitter @ComericaBank.